Your browser does not support the Unity Web Player. Want to save the Multiplier for later? Add it to a collection. As of October 23, 2015, the project has been rewritten from scratch to migrate to the new Unity Networking API (UNET), thus deprecating the old Unity Networking API. This means the old project is therefore discontinued and would not be favorable, since Unity 5 is continuously evolving. Since this prototype was designed for network multiplayer RTS at the start of the development, it was intentionally designed so that no two players are using the same computer. If you are playing alone, you can open two webpages together. Please don't worry about Player 2 for now, and continue in the Start section below. Unity Web Player does not support high DPI displays or dual monitors setup. But this may change for Unity 5.3 and up, now that it has support for dual monitors. At the moment, it is currently not supported. As of March 6, 2016, Multiplier is now the official game title, because I'm not talented in coming up with creative names. If you happen to know what name to give, please contact me at any time. Multiplier, a simplistic real time strategy game, is based on math equations. Given any math equations, your unit depends on the results of said equations, and you can play to see how well your units are. In other words, the game is simplified into only cloning, merging, and killing. You create clones, you merge, and you kill the other players. Future plans may include cloning based on other simple math equations, such as the Fibonacci Sequence (1, 1, 2, 3, 5, 8, 13, ...), or y = log(x), where x >= 1. Future math expressions may be supported. Trello Scrum board can be found here. This shows the current progression and future plans of the project. You may play against yourself, or have someone to join you on another computer. If you are playing with yourself, you must also do the Player 2 instructions. Player 1 is the host of the game. Player 2 is the client of the game. In the input field, give your game session a name. For example, "default". Wait for anyone to join. Game should start immediately afterwards. Near the top, if the game has found an internet match, it will display, "Join Match: [Game Session Name]". Press any one of them to join the game. Do not press "Client Ready", until your game finishes initializing. The client will automatically take care of this for you. Both players' games are now ready, and you're all set. Once both players are in the game, both players will start off with 1 unit each. Please continue to read Controls section for how to play. Known Issue: Multiplayer Mode and Singleplayer Mode may have hidden bugs due to game engine rewrite. Known Issue: TODO messages are scattered through the scenes. They are there to remind me of what to do, and will be removed once the scenes are completed..
All: Improved Tooltips by highlighting objects that the Tooltip is referring to. All: Changed Tooltips hotkey to "T", so it doesn't conflict with typing "+". SinglePlayer: Slightly changed menu labels when pressing Escape key during game session. All: Changed all floor colors to dark green, so it stands out from the white background. All: Changed selection box line color to a lighter green for more clarity. All: Camera panning can now be controlled using the Arrow keys. 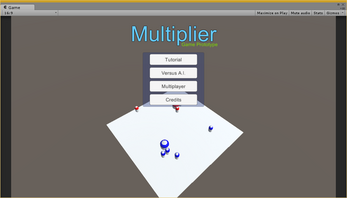 Singleplayer/Multiplayer: Added Taskbar depicting unit count and max unit count. All: Replaced Metrics Logger with a more improved version to fix the weird Text UI component issue. Singleplayer: Fixed hidden bug where Unit Attributes Editor not even once affect player's units at all. All attributes are now affected to its correct values from Unit Attributes Editor. Singleplayer: Fixed Health Bar from showing up when Metrics Logger is shown. Singleplayer: Fixed Metrics Logger not logging level difficulty and what equations were used. Multiplayer: Fixed right clicking on Minimap issues Move Command to wrong location. Multiplayer: Fixed Metrics Logger not showing up for server when client loses. Multiplayer: Fixed client not starting to log total time when the game match ends. Multiplayer: Fixed Tooltip from blocking view after the game match has started, and the player hasn't disable Tooltips yet. Added tooltips for the confusing UI. To toggle tooltips (show/hide), press SHIFT key. Fixed aspect ratio being off. Resolved graphical issues. Split Tutorials up into Sections for easier navigation. Fixed leveling rates not appearing in Simulation Mode. Added a few more lessons to the Tutorials. Simulation now reflects upon game metrics correctly. Now takes into account how many sessions in the simulation. Added Simulation Mode. Have fun with it. Fixed some bugs related to multiplayer not updating attributes correctly. Added final touches to the multiplayer. Polished the UIs. The menus are now consistent throughout the game. Rewritten Multiplayer Mode. Note that there may be hidden bugs I didn't find while rewriting Multiplayer Mode. Now supports logging your statistics per game sessions. Resolved a game design issue where players are now able to prevent themselves from entering a deadlock situation of not able to create more units. Attribute Presets are now available in single player mode. Attributes Panel UI can now update and work as intended. Added Increase/Decrease to Leveling Rates, allowing players to see relative difference between two levels. Incomplete Attribute Panel changes for custom A.I. player. Fixed issue where parsing negative numbers may result in error. Temporarily turned off Camera Zooming for now. Forgot to tweak the Singleplayer AI player. Now it's fixed. Fixed some AI player unit logic. Added primitive AI player into the game. You cannot modify the AI player yet. Incomplete tutorial mode and credits. Fixed selection box affecting minimap camera panning if dragged from playing field to minimap. Fixed splitting/merging incorrectly assuming units were already finished splitting/merging, and are in idle state. Added new unit attribute: Attack Cooldown. Fleshed out camera panning using minimap. Can now order units using minimap. Can now connect with other players via internet. Fixed issue with unit attributes not being consistent. Fixed issue with GUI not syncing across the network. Fixed issue with unit attributes not being affected by the math equations. Fixed issue with GUI hotkeys where by pressing X to enter a math formula, you will disconnect. Fixed math expression on parsing decimals. Fixed math expression on parsing double parentheses. Fixed units spazzing out when initiating splitting/merging across network. Tweaked UI positions, so camera panning will not be affected when mouse is clicking on the UI. Old prototype has been swapped out in favor of the new prototype. Lack of polish to be found, because it's new. Ability to use math expressions to give units their own attributes. Units have now been changed to capsule-shaped. Game rules have not changed. Fixed splitting not working in the tutorial. Added health bar to the units in the tutorial. Explained what the health bar does in the tutorial. Combined "Attack" and "Move" together in the tutorial. Hotfix: Mouse isn't getting focus. New Tutorial mode added in for new players to try and test. Added simple analytic data that will show up on the screen when the game session is over. Added ability for units to heal over time. Fixed splitting units creating glitchy split animation on the client side. Streamlined merging and splitting for each units. Fixed merging may go out of sync. May introduce new bugs. Fixed scaling issues related to scaling exponentially and not incrementally. Tweaked selection so that players can now select units without any hassles. Fixed being able to merge with other units of different levels. Fixed issue with inconsistent dividing behavior. Reverted back to previous version due to some changes causing inconsistent behaviors. Fixed issue such that the player cannot see if their units are taking damage.